A global discussion is being held today, October 16th, on the topic of inequality. Organized by Blog Action Day, this year’s event brings together bloggers from over 100 countries to consider an issue of vital importance. Inequality evokes images of poverty, abuse, injustice, discrimination, suffering, so ubiquitous that we often feel there is little that we can do to address these problems. 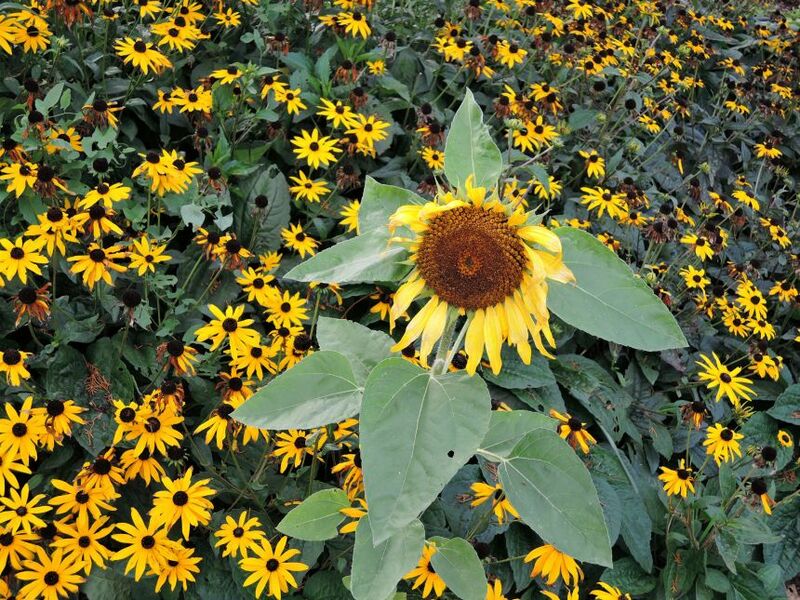 Sometimes, they are even considered part of the human condition to be simply accepted and endured. Yet, inequality is mostly man-made, and amenable to intervention and change. There are numerous ways open to us to redress skewed balances, and perhaps the most effective ones start right here, right now: from each one of us becoming aware of our own contribution to the layers of inequality in everyday life. In my earlier posts I reflected on the language of art and its role in bringing awareness into the equation. Looking at artists’ creations not usually associated with inequality, I noted how Anselm Kiefer’s work embodies remembrance in his use of materials such as clay and metal fragments; how Frank Auerbach’s long preoccupation with repair manifests in his heavily encrusted paintings of the same subjects, over and over again; Kader Attia’s concern with the fragility and malleability of meaning and the cyclical processes of creation, recycling, and re-appropriation. 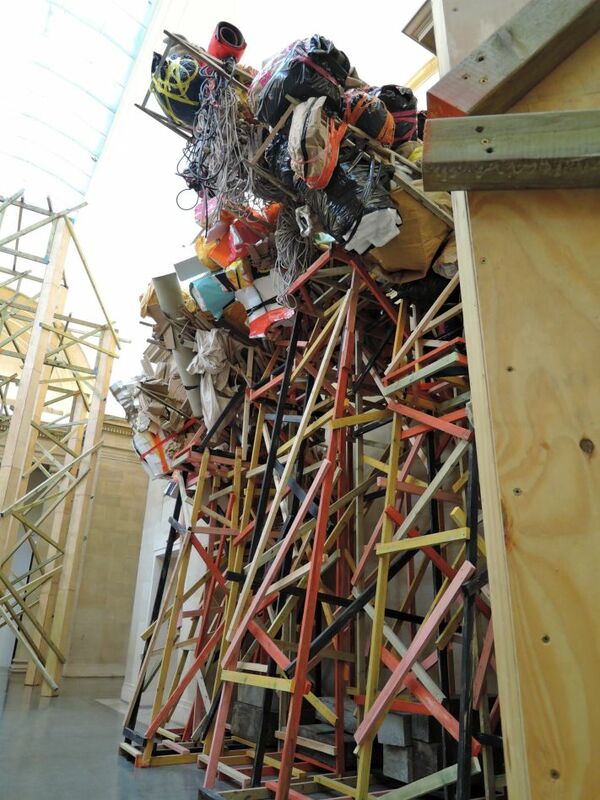 Phyllida Barlow’s juxtapositions connecting us to the history of use and abuse of materials and resources. Malevich’s ways of lifting painting out of the necessity of depicting reality… All these ‘revolutionary’ approaches to painting and sculpture, I saw as being instances of digging under layers of appearance, bringing out the asymmetries, the inequalities in the building blocks of our world. In this sense, good art becomes a language mediating our preconceptions, and experience, re-shaping our ways of seeing the world. Specifically, becoming aware of the subtle ways inequality arises, expresses, and perpetuates itself in our everyday interactions, is the first important step in helping rebalance unequal relationships. For instance, common words we use unthinkingly can be a major way of maintaining inequality as well as a vehicle for change. Mary Beard, Cambridge professor in classics, in her recent call for a grey revolution, noting this double-edged potential in language, urges us to reclaim the word ‘old’ from the negative connotations it has acquired. In particular, our associating old age with negative traits, rather than acknowledging it as a source of pride, needs to be examined: in our accepting comments such as “you don’t look your age” as a compliment, she observes, we come to maintain this form of imbalance. 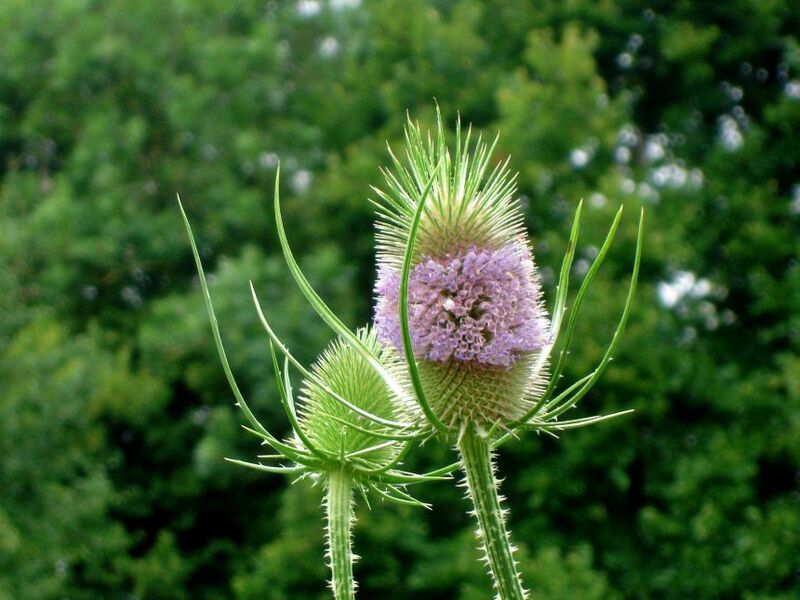 We prefer to deny the reality of a natural stage of life, because we have come to see it as only riddled with problems: wrinkles, forgetting, instability, unemployablility, illness. The wisdom, acceptance, achievements, survival, reflectiveness,… that go with it, seem powerless to counteract the negative values we have come to associate with ageing. And this matters because attitudes towards the older generation are at the core of governmental policies making available, or denying, further opportunity, adult education, support, healthcare, and social resources. In addition to ageing, further examples could be drawn from areas of mental ill-health, poverty, homelessness, unemployment, immigration, conflict… Attributing the cause of these predicaments to the individuals concerned – e.g. genetic or acquired traits, social, or national character – and keeping them separate through linguistic devices, only continues our turning a blind eye to what we have the power to address and change. Becoming aware/re-minded of this tendency in ourselves, helps us redirect our attention to, and question the assumptions determining our relationship to others. 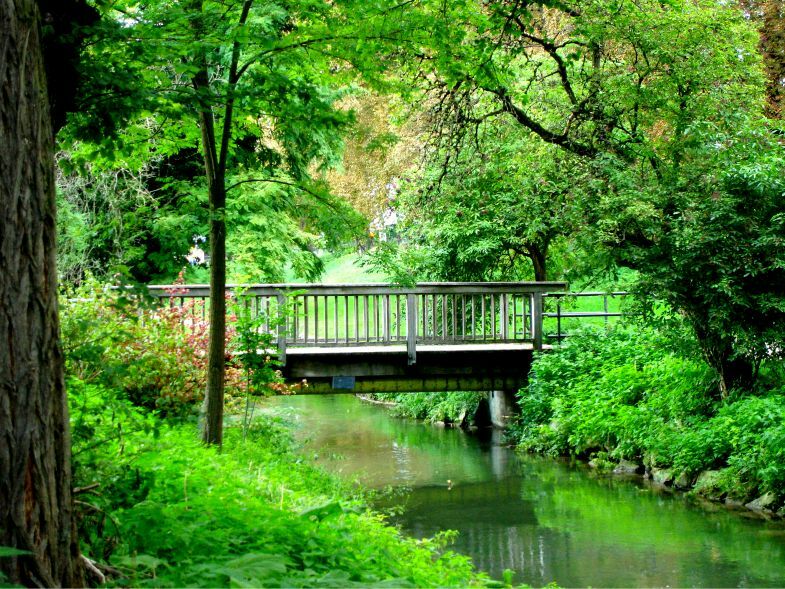 This awareness enables each one of us to make a positive contribution, however small, to the big problem of inequality. But let literature have the last word. Let E. M. Forster’s “Only connect” become a motto for the day, and the year ahead. This year, Blog Action Day is partnering with Oxfam, whose work and involvement around the world has brought in-depth understanding of the issues involved in inequality. Last year (2013,) Blog Action Day’s theme was on Human Rights. My blog post on “Human Rights and Wrongs” was one of three featured on Amnesty International‘s online Journal Livewire. On October 16th, 2014, a global discussion is being held on the topic of inequality. Organized by Blog Action Day, this year’s theme brings together bloggers from over 100 countries to contribute on a matter that becomes increasingly urgent. It is ubiquitous, but so are the processes that ameliorate and even help reverse it: awareness and reflection, empathy, generosity; pooling of resources and co-operation; language, art, literature; institutions, policies, humanitarian approaches at national and international levels are just a few that come to mind. Inequality is an urgent and vital topic for discussion, and you may have noticed, I am taking part this year with a series of posts. * Are you? 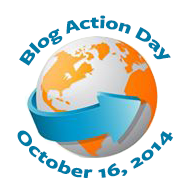 If you are not sure what to write about, Blog Action Day on FB has a number of tips for bloggers. If you don’t have a blog, you may use your FB account or other social media. See also the Blog Action Day 2014 site. If you are looking for literary inspiration on themes of poverty, homelessness, begging, and poetic resonances to these issues reflecting perspective and culture, see The Kindness of Strangers, a six-part series by Swedish poet Anna Maris on The Haiku Foundation site (you’ll need to scroll down the blog entries for the earlier posts). Bye for now! See you on the 16th, online. The day before Anselm Kiefer was born, the house next door to his parents’ was completely destroyed. Only a sewing machine had remained intact. This event is linked, in several articles I came across, to his painter’s vision, his choice of subject, painting technique, and use of materials. “an astonishing look at the awful burden of history”. From the moment in time to expanding time, Kiefer’s objects do not stop this process of ‘remembering’ even when ‘finished’: the clay he uses shrinks, crumbles, and drops off; dried bits of material disintegrate, fall down, and become litter on the gallery floor to be returned to him. Even when the works don’t disintegrate, Kiefer ‘damages’ them deliberately, as if the state of being damaged, used, wounded, is the reality of painting. Here is where Kader Attia’s concern with re-appropriation of materials comes alive. Making/finding the rubble and turning it into a work of art, then turning this/letting this grow into rubble again, only to use the bits that come off in new work. Like the particles of the cosmos, on a microscopic level, Kiefer’s materials, and creations, belong together, morph, develop, die, and are reborn to a new form. 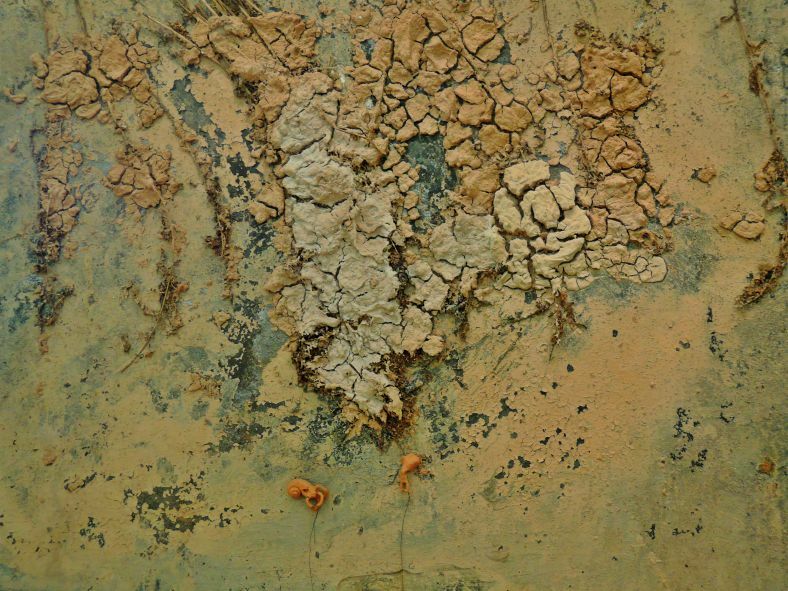 If this sounds benign, it is because Kiefer’s work reminds us to see it this way; it is a meditation on the ongoing, day to day processes of growth, decay, and regeneration. War, though, a main concern for Kiefer, and our time, is one of the most urgent and sudden, both violently disruptive and accelerative processes there are. When we linger in front of, or indeed around, a Kiefer piece, the terror and horror of the destruction of war; the awe of the immensity of scale come to mind: the holocaust (for Kiefer, perhaps the most personal reference); Afghanistan, Iraq, Libya, Congo, Gaza, Syria, Hiroshima… The beauty of the arrangements, of the depictions, and the terror of the depicted resonate with Rilke’s terrible angel which seems to be haunting Kiefer’s work. 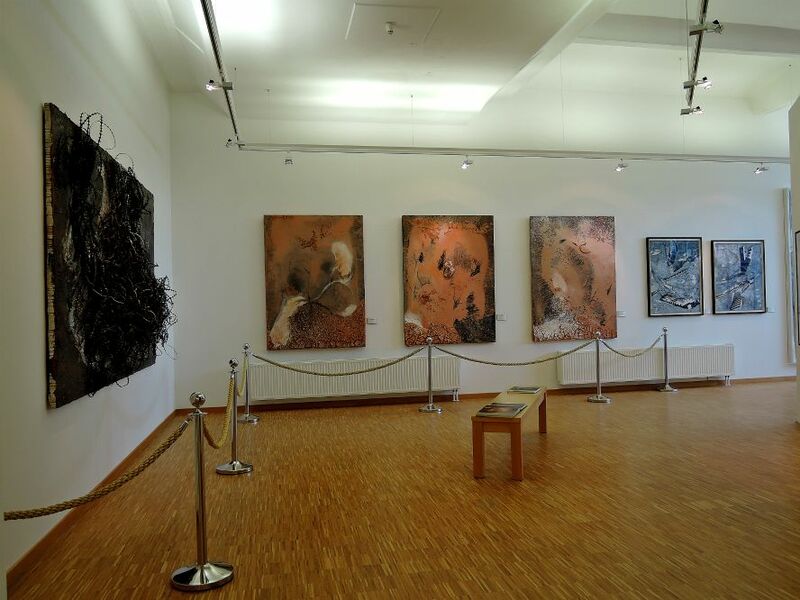 Recently, I revisited some of Anselm Kiefer’s work at the “Art Museum Walter” at the “Glass Palace”, an industrial monument in Augsburg: Eleven ‘paintings’ and two sculptures on show. While they are not new — forty per cent of the Royal Academy work is said to have been created for the show — the Walter collection displays excellent work firmly rooted in time and memory, while remaining open to possibilities of interpretation (the photos included here are from the Art Museum Walter) . 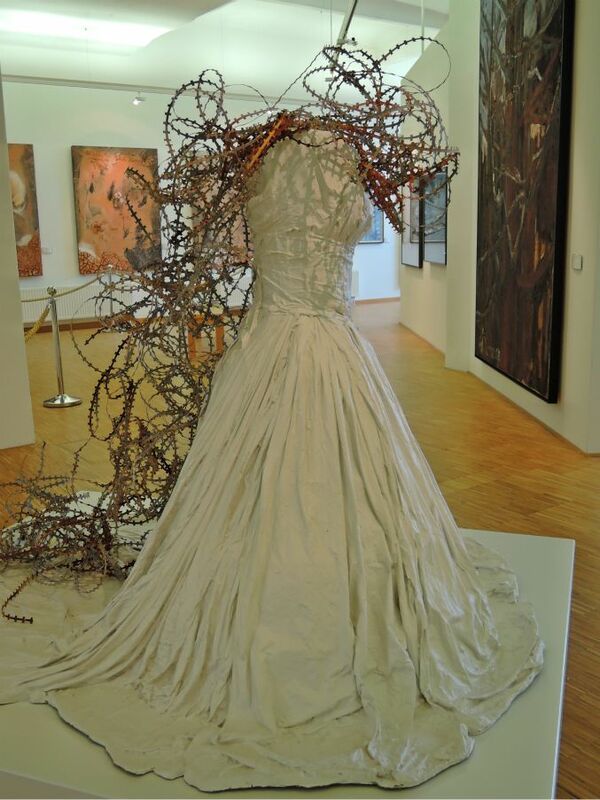 Here too is an equivalence: the metaphor of the sewing machine from Anselm Kiefer’s past finds an echo in Germany’s textile industry surviving destruction. Interesting to note that, in this context, some have referred to Augsburg as the ‘Manchester of Germany’, echoing the transition from a crafts-/guild-based industry to one of machine-based mass production, including the exploitation, poverty, and social upheaval this involved. In this juxtaposition, Kiefer’s work, in bringing together the themes of inequality and memory, continues to weave anew the fabric of history. If you can, visit the Art Museum Walter. Information about it here. If you are not in Augsburg, or London, you need not worry. In Kent, there is an exhibition to console your artistic longings: my daughter Maria Pierides’ solo show at Creek Creative Studios in Faversham. 23 — 28 September 2014. Rush there, the Studios are open only till 4 pm on Sunday the 28th! For the first time since his death in 1935, Malevich’s work is featured at the Tate Modern. Fresh, moving, as well as full of movement, confident, it is a work that touches the viewer, questions and carries her away with confidence. It did me! I liked the tagline: The man who liberated painting. I know the abstract expressionists in particular are said to have done this, but here is a whole new storyline. This exhibition shows the history of a free spirit, in art anyway, seeking the path to a new art: art freed from the obligation to equal reality, allowing colour and form to interact freely. Unlike Kandinsky, who made them sing in elaborate combinations, Malevich painted geometrical shapes in floating, superimposed, juxtaposed relationships; above all, squares and circles of pure colour. Out of habit, I note that Malevich was the first of fourteen children, only nine of whom survived; that his family were refugees from Poland, fleeing events at home; that poverty and having to move often, were part of his personal history. All this may well have had an impact on his search for an alternative world and a different way of seeing things. In a post about inequality, these personal details become signposts, showing some of the routes unequal paths may take. Malevich’s initial enthusiastic support of the Leninist revolutionaries could also have been fired by this wish to create a new world. He freely gifted his new art of Suprematism to the revolutionary regime, that, seeking to overcome the chasm between rococo Tsarist Russia and the revolution of the people, sought new ways of seeing, of expression, of being. Here was reality being defined and changed by art. Here was an artist’s l(eye)ns, lens, producing its way of seeing the world. 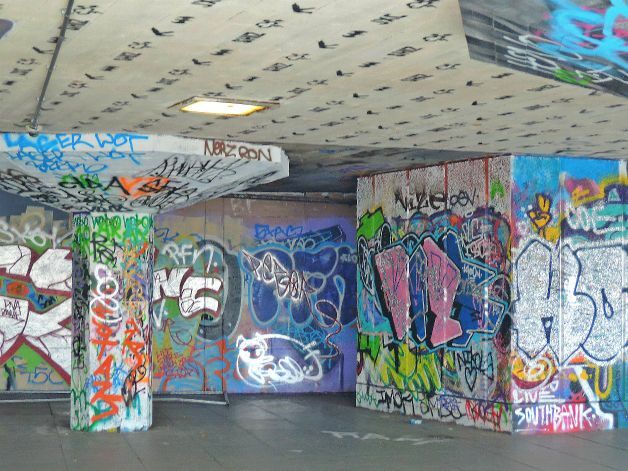 The Forbes contributor points out the similarity with Banksy, and his creations on the walls of San Francisco’s Mission District; and of course, there is the graffiti at London’s South Bank. 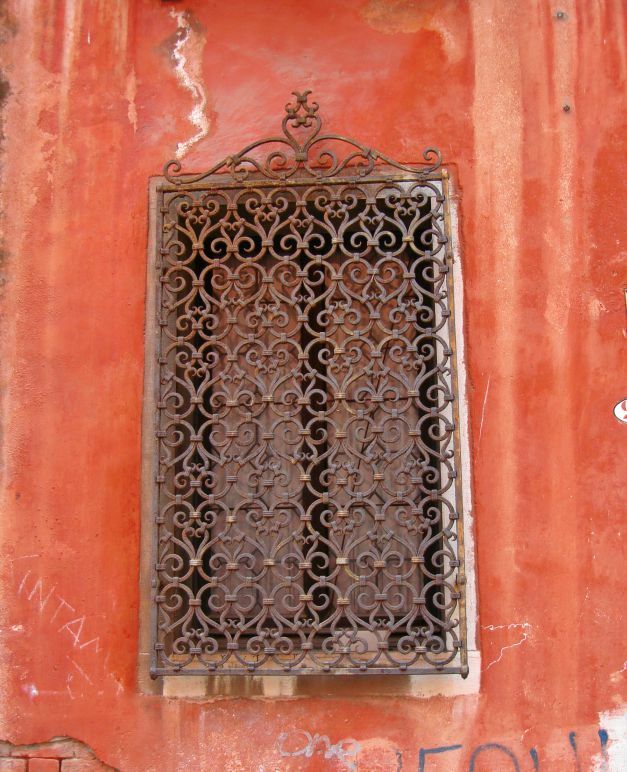 Not only exteriors, but interiors too were being defined by the new world. 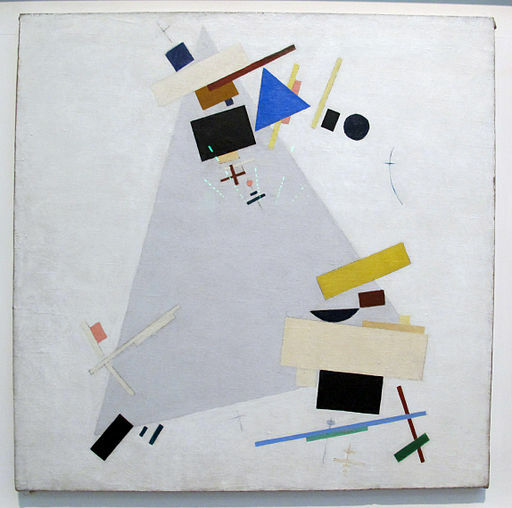 Malevich’s symbols were painted on china and crockery; when materials and resources were scarce, the old china of Tsarist times were recycled: the new motifs of triangles and squares being painted on top. The experience of inequality in Tsarist Russia led millions of people to seek a new world of symbols, untainted by the past. Actually, I liked Malevich’s new ways. The first time round, in his developing Suprematism, freedom fizzed out of his painting. This time, restrained, yes, by the prohibitive regime, by time, by other factors too. But it seems to me, on this visit, that these restraints added a new dimension to his work. The portraits I saw at the Tate exhibition’s last room, were not limited by, but smouldered with restraint and pathos; there was much condensed emotion, history, reference, symbolism to fully engage. Would Malevich have created these works without the benefit of his later years? Without his experiences, good and bad, at the center of changing times? Without wanting to simply attribute the spurt of creativity and genius to inequality and misfortune — far from it — I would not wish to ignore their existence and possible role in Malevich’s later work either. In any case, I think he made it new, for a second time. Impossible not to be surprised by this monumental presence at the Duveen Galleries, Tate Britain! 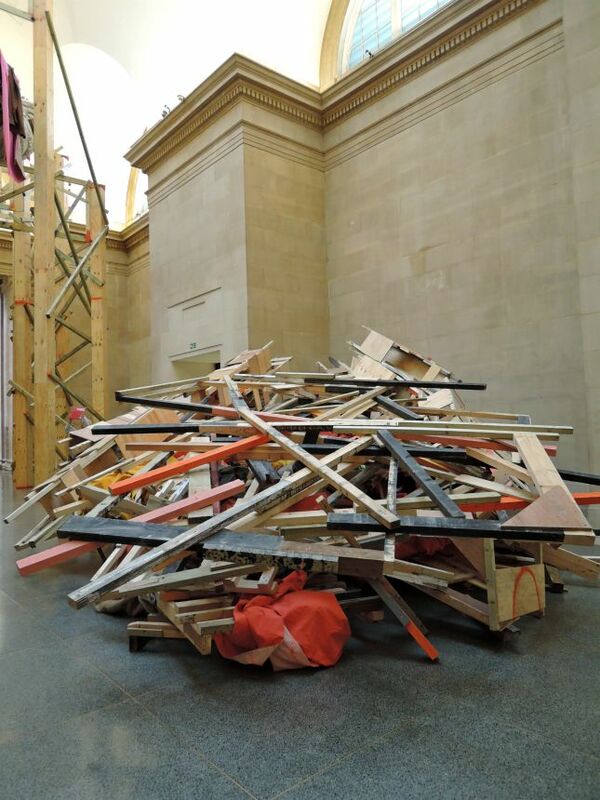 Phyllida Barlow’s installation, ‘dock’, makes quite an impression on the unsuspecting visitor walking into the Tate. Yet taking a few steps through the artwork, and a deep breath, the mind starts working. Isn’t this… err, fragile… recycling materials… momentous… look, plastic bags, cartons… How interesting, that the Tate too (see Kader Attia, Whitechapel), in commissioning Phyllida Barlow’s work in 2014, ends up with a piece that reflects on fragility, transformation, repair, re-appropriation… Though these are not words or concepts I saw used in the descriptions of this work. A different kind of inequality is being noticed here: disparate, different objects and materials, producing a different kind of vision: a different ‘eye’. Yet this difference might also be seen as one of materials ‘unequal’ to those usually seen at the Tate. In fact, marble and gilded frames, the austere, classical beauty of the Galleries contrast with the used cartons and plastic that hold this work — seven pieces in total — together. Are the latter unequal to the task? My answer would be: no, they fit Barlow’s work perfectly, by way of bringing out the juxtaposition of the two extremes. Her fascination with the grand Tate Britain sitting majestically next to the Thames, and its docks, has produced a fitting installation. Loading and unloading goods that came and went irrespective of their worth associate with this mass, and mess of materials, producing a work seemingly in the process of collapsing. 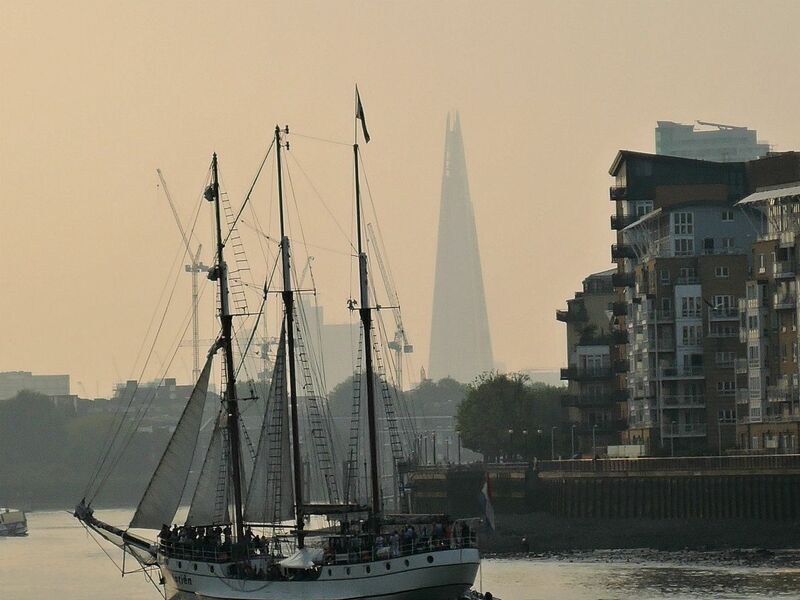 After all it is the Thames that connected Imperial Britain to its colonies and the world… a ‘stage’ for playing out inequalities, so perceptively linked by Joseph Conrad to the Empire’s Heart of Darkness. Barlow, in a Guardian interview, reminds us of how our age has been marked by the iconic fall of many things: the twin towers and all they represented for the whole world, for instance; the markets; the fall of dictatorships and idols too. So the pull of gravity and precariousness, ever present in our age, and in Barlow’s work, are vital to this specific project. Interestingly, she says that, until recently, she used to dismantle and then recycle her previous exhibits at the end of her shows. This post is part of a series of articles written for Blog Action Day 2014, held on the 16th of October 2014, on the theme of Inequality. Near Brick Lane and Spitalfields Markets, and amidst the hustle and bustle of a Saturday afternoon crowd, I discovered Kader Attia’s (b. 1970, Paris) new work of art at the Whitechapel Gallery, “Continuum of Repair: The Light of Jacob’s Ladder.” No photographs were allowed, but I took a picture of his taped interview that was shown at the Gallery, which gives you a good idea of the installation visible in the background. Said to be inspired by the religious story of Jacob’s ladder (specifically Jacob’s vision of angels ascending to heaven), as well as by the history of the room of the installation itself (it was the reading room of a former library), it is a work that engages, questions, moves and, well, speaks volumes! It is in this context of knowledge overseen and underlined by war and destruction, that Attia’s concept of repair acquires extra layers of meaning, adding depth to our quest for ever increasing heights of aspiration. This work is a detailed and serious reflection on our Faustian search for knowledge and certainty, for ever new ideas and creativity to define our identity, and the illusions, and disillusionment this effort entails. Our ‘new’ creations, placed within the context of history of science, of art, of humanity, are shown to be, on some level, ‘appropriations’, or ‘partial repairs’ of what has come before, what has been previously discovered, then forgotten/destroyed, and lost; on another level, this rediscovery serves as a prompt to humility: our ideas, our achievements are but a part of a greater whole and not so much new, as rediscoveries, archaeological specimens in the cabinet of a wider, richer, and vast cosmos. This post is part of a series written for Blog Action Day, to be held on the 16th of October 2014, on the theme of Inequality. Attia contributes to a body of work that reflects on the effects of human ambition — First and Second World Wars, and their aftermath, of colonial and imperial ambitions — and the attempts to rebuild, repair, and re-appropriate its objects.